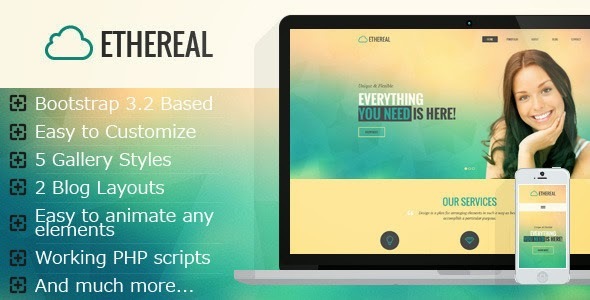 Ethereal is Onepage and Multipage multipurpose Parallax HTML template. It suits for any type of portfolio, personal website, business, corporate, design studio etc. There are 3 folio pages with “google images” type gallery and 2 isotope galleries with full width and standard layouts. Item Reviewed: Ethereal Multipurpose Parallax HTML Template 9 out of 10 based on 10 ratings. 9 user reviews.